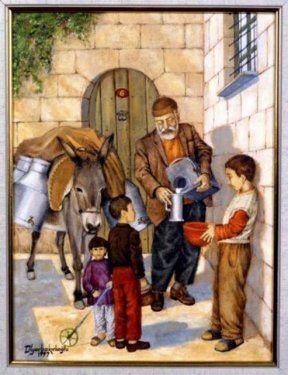 Those good ol days when the milkman would deliver fresh milk right at your doorstep, daily. Until the time my parents were kids they enjoyed these privileges. Our grandpas and grandmas were so fortunate. The generation which you kiddos enter is an era when these old professions that helped provide sustainable livelihood to so many poor folks are no more. No milk in the fridge? Dad or mom have to walk or drive to the nearest convenience store to buy it. Sad eh? But at least let yourself know that these good ol days did exist once upon a time with much happiness and peace. This image depicts Ottoman era, Turkey. Amazing, wonderful ....... those good ol days ! !